James Owens was born and educated in Detroit Michigan, The Motor City, to a family that had been building cars since 1926. After graduating with a B.A. in illustration from The Center for Creative Studies he embarked on a miss-spent youth in the advertising business. W.B. Doner, J. Walter Thompson and Campbell Ewald are just a few of the agencies for which James provided automotive illustrations. 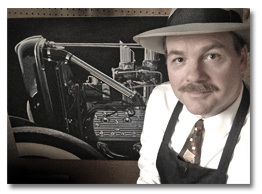 Channeling his love for classic automobiles and inspired by the illustrators of the golden era, he taught himself to oil paint, something that was not possible in the modern ad business due to short deadlines. James makes his home in Mesa Arizona and drives a 1952 Hudson Coupe.